I discovered that Turks and Caicos Weekly News Online featured an article (August 12, 2011) about our project participant Nicholas Turner. The opening paragraphs from the article. TCI’S long neglected agricultural sector is in for a major boost thanks to a forthcoming national training centre to educate a new generation of farmers. North Caicos’ listless government farm is to be transformed into a venue to research the best way to grow crops – with the emphasis on organic produce. Aspiring farmers will be given plots of land on the vast 160-acre site for a peppercorn rent. They will then receive training from farm staff on the best techniques on everything from irrigation to fertiliser. 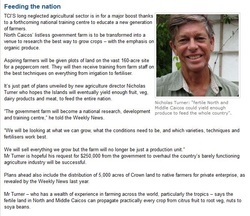 It’s just part of plans unveiled by new agriculture director Nicholas Turner who hopes the Islands will eventually yield enough fruit, veg, dairy products and meat, to feed the entire nation. #Water-from-air #greenhouse subject to the 10/10 rule? Apparently, I should not be so frustrated that the WaterProducer-Greenhouse™ project has not yet built its first installation! New technologies have often taken about two decades to become mainstream. Steven Johnson gave several examples in his interesting book (published 2010) titled, Where good ideas come from: the natural history of innovation. It takes typically about ten years to construct the "platform" and another ten years for widespread adoption (the 10/10 rule). I am experiencing this (agonizingly) with the WaterProducer-Greenhouse™ Project. The two year viability study, completed in 2003 resulted in a unique knowledge base (the reports to CIDA) that could be marketed to interested people. Lots of mild interest. Many hours are spent on personal networking and development of this information-rich website. Now, more than ten self-funded years later, I am hopeful that there exist some early adopters with the imagination and guts to exploit this innovative technically and commercially viable platform (along with our team's expertise) for improving water and food security for the people living on and visiting tropical small islands. Water-scarcity remains one of the global "key societal challenges" reminds an editorial in the January 2, 2014 issue of Nature. In the same issue, Colin Macilwain listed examples of mounting societal problems in this order: water, food, health, energy, and climate change. The WaterProducer-Greenhouse™ addresses the first two problems. a necessary increase in agricultural productivity. 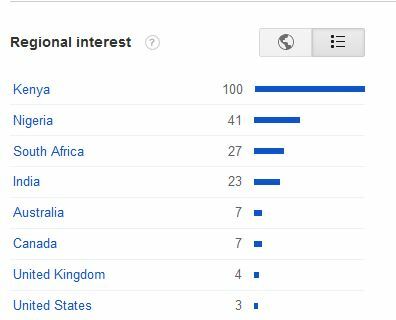 will have for confronting global water scarcity. Efficient direct use of a 'new' source of water, the water vapour in the air, combined with commercial-scale hydroponic horticulture does appear to be a worthwhile technological option for tropical small islands. Roland Wahlgren, BSc MA, is a Physical Geographer and owner/President of Canadian Dew Technologies Inc. (CDTI, www.candew.ca). He has researched water-from-air technologies since 1984. Peer-reviewed publications in the water-from-air field include Atmospheric Water Vapour Processing, Waterlines, Practical Action Publishing (1993); Atmospheric Water Vapour Processor Designs for Potable Water Production: A Review, Water Research, Elsevier Science Ltd. (2001); and Water-Producing Greenhouses for Small Tropical Islands: Ahead of Their Time or a Timely Solution?, Acta Hort. 797, ISHS 2008, (2008). CDTI, founded in 2003, has performed research and development work for client companies interested in commercializing water-from-air technologies. The R & D work included building prototypes of 20 L per day and 2500 L per day machines. The 2500 L per day machines were commercialized. CDTI commissioned, on behalf of its client, two 2500 L per day machines in Belize City in 2006. 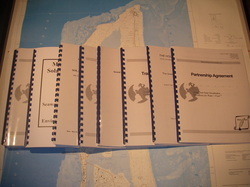 As Principal of Atmoswater Research (www.atmoswater.com; founded 1997), Roland Wahlgren was the scientific/technical consultant to the CIDA-supported Grand Turk Water-producing Greenhouse Viability Study from 2001 to 2003. He performed the role of project manager for the CIDA project. He has persisted in fund-raising efforts and maintained the project website for several years. He completed recently a major revision of the website.